[S601] UK National Census for 1881 for UK, "RG11/3788 f122 p47." [S72] UK National Census for 1891 for UK, "RG12/3071 f113 p47 248." [S601] UK National Census for 1881 for UK, "RG11/3777 f37 p6." [S2] UK National Census for 1871 for UK, "RG10/3892 f32 p39 188." [S72] UK National Census for 1891 for UK, "RG12/3059 f113 p19 93." [S1051] Website Lancashire BMD (http://lancashirebmd.org.uk/) "Wigan : C19/3/269." [S704] UK National Census for 1901 for UK, "RG13/3560 f73 p1 7." [S1051] Website Lancashire BMD (http://lancashirebmd.org.uk/) "Wigan : C22/1/437." [S2] UK National Census for 1871 for UK, "RG10/3893 f140a p28 128." [S2] UK National Census for 1871 for UK, "RG10/3893 f141 p29 128 continued." [S45] Website FreeBMD (http://freebmd.rootsweb.com/) "Marriages Mar 1876 Winnard Elizabeth Wigan 8c 45." [S45] Website FreeBMD (http://freebmd.rootsweb.com/) "Marriages Mar 1876 HOLLAND Daniel Wigan 8c 45." [S1051] Website Lancashire BMD (http://lancashirebmd.org.uk/) "C19/2/262." [S48] Online index to the UK National Census for 1901 for UK "RG13/3565 f9a p10 56." [S45] Website FreeBMD (http://freebmd.rootsweb.com/) "Deaths Dec 1874 WINNARD Gerrard 37 Wigan 8c 65." [S637] Original marriage certificate of William Holand and Emily Howarth, 28 February 1891 "unknown cd." [S601] UK National Census for 1881 for UK, "RG11/3776 f103 p38." [S2] UK National Census for 1871 for UK, "RG10/4107 f207 p19 92." [S48] Online index to the UK National Census for 1901 for UK "RG13/3560 f87a p29 156." [S641] Copy birth certificate of Emily Howarth, 17 November 1872 "unknown cd." [S45] Website FreeBMD (http://freebmd.rootsweb.com/) "Marriages Dec 1870 HOWARTH Samuel Oldham 8d 998." [S45] Website FreeBMD (http://freebmd.rootsweb.com/) "Marriages Dec 1870 BERRY Alice Oldham 8d 998." [S72] UK National Census for 1891 for UK, "RG12/3062 f8 p9 52." [S639] Original marriage certificate of Robert Price and Alice Holland, 20 September 1919 "unknown cd." [S640] Copy birth certificate of Robert Price, 2 October 1894 "unknown cd." 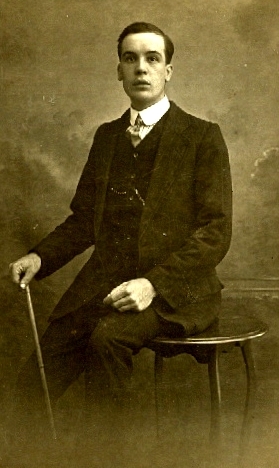 WW1* between 1914 and 1918� John 'Jack' Livesley went to war between 1914 and 1918; army. [S261] Baptism, St Thomas, Golborne, 1864-1903 "p288/2303." [S48] Online index to the UK National Census for 1901 for UK "RG13/3587 f28." [S704] UK National Census for 1901 for UK, "RG13/3587 f28 p47 249." [S1051] Website Lancashire BMD (http://lancashirebmd.org.uk/) "Wigan : C8L/6/48." [S69] Unknown editor ed. St Thomas (Golborne) MI "14B." [S659] Obituary for Margaret Livesley, 1938. [S72] UK National Census for 1891 for UK, "RG12/3057 f4a p2 12." [S261] Baptism, St Thomas, Golborne, 1864-1903 "p244/1950 29 Jan 1888 Ethel Dau. of John & Alice Jenkin, Abram, labourer, C E Turner Born Nov 20 1887." Abode: Oak Villas Bolton Rd. [S1] Website IGI (www.familysearch.org) "C749221 1813-1940." [S1] Website IGI (www.familysearch.org) "P014421." [S2] UK National Census for 1871 for UK, "RG10/3910 f23 p39 176." [S277] Baptisms, BVRI, 1655876 1777-1798 Mary dau of Gilbert Marsh. [S1] Website IGI (www.familysearch.org) "M014425 1800-1822." [S626] Marriages Transcript, St Oswald (Winwick), 1813-1841. [S76] UK National Census for 1841 for UK, "H.O. 107/524/7 f26a p1." [S40] UK National Census for 1851 for UK, "HO 107/2204 f68 p6 19." [S47] UK National Census for 1861 for UK, "RG9/2799 f11 p15 81." [S2] UK National Census for 1871 for UK, "RG10/3898 f96a p18 88." [S69] Unknown editor ed. St Thomas (Golborne) MI "38/40G." [S277] Baptisms, BVRI, 1469063 1812-1823. [S76] UK National Census for 1841 for UK, "H.O.107/0524 ed 7 f26a p1." [S277] Baptisms, BVRI, 1469064 1823-1834. [S1051] Website Lancashire BMD (http://lancashirebmd.org.uk/) "Wigan & Leigh : C33/8/142." Source: FHL Film 1469067 Dates: 1854 - 1872. [S2] UK National Census for 1871 for UK, "RG10/3891 f120 p17 79." [S45] Website FreeBMD (http://freebmd.rootsweb.com/) "Marriages Jun 1869 DEAN Esther Wigan 8c 1." [S45] Website FreeBMD (http://freebmd.rootsweb.com/) "Marriages Jun 1869 LIVESLEY Thomas Wigan 8c 1." [S596] Baptisms Transcript, St Thomas (Ashton in Makerfield), Bap 1828-1873 "p95." [S40] UK National Census for 1851 for UK, "HO 107/2200 f350a p1 3." [S47] UK National Census for 1861 for UK, "RG9/2780 f6 p5 26." [S601] UK National Census for 1881 for UK, "RG11/3771 f6 p7." [S902] Liverpool & SW Lancs FHS ed. St John the Evangelist (Abram) MI "DD24." [S1001] Burials, St John the Evangelist, Abram, 1839-1899 "18 Nov 1880 Esther Livesley of Abram 37." [S601] UK National Census for 1881 for UK, "RG11/3771 f26 p9." [S45] Website FreeBMD (http://freebmd.rootsweb.com/) "Births Mar 1871 Livesley Alice Margaret Wigan 8c 92." [S47] UK National Census for 1861 for UK, "RG9/2780 f8 p9 47." [S40] UK National Census for 1851 for UK, "HO 107/2200 f352a p5 17." [S2] UK National Census for 1871 for UK, "RG10/3891 f117a p12 57." [S47] UK National Census for 1861 for UK, "RG9/2780 f7a p8 47." [S45] Website FreeBMD (http://freebmd.rootsweb.com/) "Marriages Dec 1877 Hart James Wigan 8c 2." [S45] Website FreeBMD (http://freebmd.rootsweb.com/) "Marriages Dec 1877 Livesley Jane Anne Wigan 8c 2." [S1051] Website Lancashire BMD (http://lancashirebmd.org.uk/) "Wigan & Leigh : C7/1/193." [S2243] E-mails from Ken Bowden to Alan Bennett, 2008 "James Hart, was found drowned in the moat on Abram Hall Farm on 9 March 1883. According to the death certificate, he was initially buried on the farm but at some point was moved to St Johns churchyard Abram." [S902] Liverpool & SW Lancs FHS ed. St John the Evangelist (Abram) MI "DF24 In Affectionate Remembrance of THOMAS HART departed this life May 20 1881 aged 30 yrs. Also JAMES HART brother of the above who departed this life March 8th (sic) 1883 aged 28 yrs. Also HANNAH HART who departed this life October 27th 1963 aged 82 yrs." [S72] UK National Census for 1891 for UK, "RG12/3057 f25 p43 203."